Le Club AccorHotels has launched a separate bonus Lufthansa Miles&More promotion for stays at Novotel and Mercure brands. Miles&More members earn double miles (500 base + 500 bonus) for stays at Mercure and Novotel hotels (two night minimum stay). 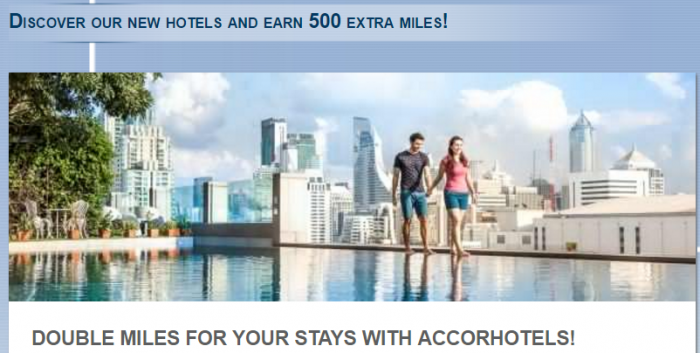 Note that the minim stay length for Mercure & Novotel hotels is two nights to earn the 500 base Miles&More miles. You can earn this bonus maximum of four times. You must have your earning preference set to partner points/miles and have Lufthansa Miles&More chosen. Make sure that you don’t have Le Club AccorHotels points in your account when you do this unless you want them all converted to Miles&More miles. So, basically 1,000 Miles&More miles per two night stay at Mercure & Novotel brands. Can make sense if there are no other good bonus points promotions around and one collects Miles&More miles. 1. General Le Club AccorHotels terms and conditions apply to the Miles & More Double Miles offer and you must be Le Club AccorHotels member to benefit from it. 2. This offer entitles Le Club AccorHotels members, regardless of their status, to benefit from earning x2bonus points (which equals 500 extra award miles per eligible stay) for a stay in one of the participatingNovotel, Novotel Suites and Mercure hotels in Le Club AccorHotels Loyalty program. In order to benefit from this bonus, the member must have activated Miles &More as preferred conversion option ahead of the stay. This option should remain activated until the member receives the points related to his/her stay on his/her Le Club AccorHotels account. 3. This offer is valid for a member’s stay from 01/05/2017to 31/07/17 in one of the participating hotels worldwide,and booked between 01/05/2017and 31/07/2017. 4. The stay must be a minimum of 2 nights at Mercure, Novotel and Novotel Suites. 5. Any consecutive stays (check-out and check-in same day) in the same hotel, will be considered as a single stay. This single stay will be eligible once to the Miles & More Double Miles offer. 9. The bonus are credited in Le Club AccorHotels points within 10 days following the end of his/her stay and converted within 6 weeks into Miles & Moreaward miles according to applicable conversion rule. 13. Please specify the reference 49420 in all your communications with AccorHotels call centers or customers care services related to this offer. 14. Every member can benefit up to 4 times from this offer. Next articleReader Question: Should I Ditch Hotel Loyalty Programs And Go For Best Price Through Hotel Portals?